Anja Ringgren Loven is Danish aid worker who was working in Nigeria, where she found an abandoned boy who was starving. The locals labeled this little boy as a witch. She decided to take this boy and today he is recovering very well. She named him Hope, as he is real proof that all of you should believe in the impossible, try harder and hope for the best. Anja posted a selfie of her and the little boy Hope on her Facebook profile. This heart-warming photo has over 7800 likes. This incredible woman says that she gets many questions about Hope and explains that she is amazed of all the love that kids from all over the world send. Anja says that Hope is little miracle. Hope is very strong and intelligent boy and he is beginning to say little words. They are still waiting for his surgery, but Anja says: “where there is love, there is life”. It is interesting that Anja wrote that the reason why she gave him this wonderful name is because this boy has special meaning to her. 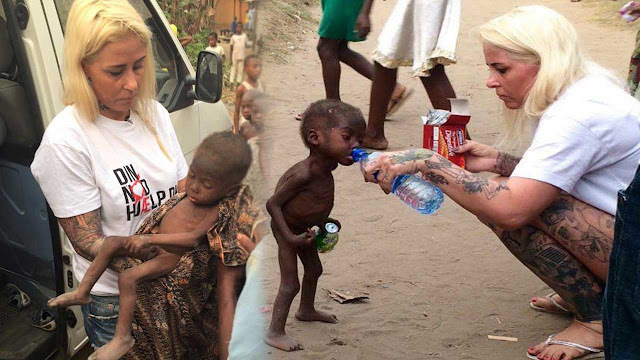 She even had tattooed HOPE on her fingers years ago, and to her it means: “Help One Person Everyday”. Today, thanks to Anja, this wonderful boy looks really great!